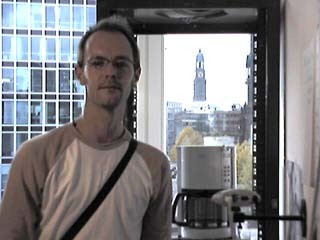 1991 Quentin Stafford-Fraser and his collegues at Cambridge University in England constructed a camera to check the coffee level so they won't have to walk all the way to find it empty anymore. 1993 the cam went online. 2001 the lab moved, and as the coffee machine (a Krups ProAroma) finally broke, its story seemed to have ended. Finally the famous Trojan Room Coffee Machine was purchased by auction (5344,38 Euro) by Spiegel Magazine in Hamburg, Germany. Krups repaired it free of charge. So eventually the coffee maschine is to be seen online again - this time from two perspectives. We like to thank the Spiegel-Online editorial department for letting us take the images.